*Southwest boardwalk of Rock Cliff is closed due to water damage. Other areas at Rock Cliff are open. Day-Use: OPEN. The day-Use is open as well as the restrooms at both the PWC and Main Ramp. The CXT pit toilets are also available in the day use area. Surface: The reservoir is now free of ice! The wedge docks have been installed at the main ramp and the PWC ramp. The Rock Cliff boat ramp is still out of the water by about 1/2 mile. If you choose to travel down the road to the water’s edge, do not leave the roadway. The mud is slimy and we cannot help you get unstuck. You will need to call a tow truck. South of the peninsula to the dam is also free of ice. Launch Ramps: The wedge docks have been installed at the main ramp and the PWC ramp. Campground: All of the RV campgrounds are now open for the season. Camping is $30 per night for tents and $35 per night for RVs. Campsites are first-come-first-serve. The cabins remain closed and will re-open May 1. Sites 1-7 are OPEN at Rock Cliff for $10 per night; you will need to hike from the parking lot. Nightly transient boat slips rentals are closed and will open May 1. Reservations can be made by calling 1-800-322-3770 or clicking on the “Reservations” link on the top right of this page. Reservations must be made at least two days in advance of your arrival and up to 4 months in advance. Reservations will resume starting May 1, 2019. Additional Fishing Info: Fish cleaning stations are closed for the winter. Click here for more information about the new fish species being stocked at Jordanelle. Road Conditions: Please respect snow plow operations. Roads will be plowed as needed. HAILSTONE: Fee area. Day use is $10/vehicle. $5 for Utah residents 62 and older. The lease docks are closed for winter. The Marina Store is closed. Park Office is open Monday-Friday, 10AM-5PM, closed holidays. All RV campgrounds are now open along with their respective restrooms. Camping is $30 per night for tents and $35 per night for RVs. Campsites are first-come-first-serve. The cabins are closed for winter. Dogs must be leashed and picked up after at all times. Remember dogs are a privilege, not a right. Dogs are NOT allowed in or around the cabins and on the public beach. For more information about Service Dogs, please contact park staff. Reservations can be made 4 months in advance of your arrival date by calling 1-800-322-3770 or online. Reservations must be made at least 48 hours in advance. Group site reservations can be made 11 months in advance. Restrooms will remain open at both the PWC and Main Ramp. The CXT pit toilets are also available in the day use area and will also remain open during the winter. ROCK CLIFF: Fee area. $10/vehicle. $5 for Utah residents 62 and older. Flooding from spring occurred on the south-west boardwalk. That area is closed. The Nature Center is now closed for the season. The boat ramp is out of the water. Launch at your own risk as it will be very muddy. Operating a motor vehicle off of the boat ramp is prohibited and you will get stuck! Hike-in camping (sites #1-7 only) are available for $10/night. The showers and restrooms are closed.t Porta-potties have been delivered for sue and are located in the parking lot. Group site reservations can be made 11 months in advance. Dogs must be leashed and picked up after at all times. Dogs are NOT allowed on the south side of the main road. Remember dogs are a privilege, not a right. For more information about Service Dogs, please contact park staff. The Kokanee have finished spawning for the year. Remember, it is illegal to possess kokanee from Sept. 10 through November 30. ROSS CREEK: Day Use fees are $10 per vehicle or $5 for Utah residents 62 years of age or older. There is a self-pay envelope station at the entrance. Remember dogs must be leashed and picked up after at all times. Dogs are a privilege, not a right. The trails are open to non-motorized use only. The new non-motorized boat ramp parking lot is now open. You must self-decontaminate for Aquatic Invasive Species/mussels if you have been to contaminated water including Lake Powell. You must be dry for 18 days in the springtime for simple boats like sailboats and non-motorized vessels (ex. paddle boards) or be professionally decontaminated before you launch at another water body. If you have a more complex boat with ballast tanks or in/outboard motors with unverified water, it’s 30 days of dry time regardless of the time of year or professionally decontaminated before you launch at another water body. We do not currently have staff around 7 days a week for decontaminations. Please contact the park to make an appointment if you need to be professionally decontaminated. If you have been to Lake Powell and your boat has ballast tanks, you must be decontaminated regardless of the time the boat has been out of the water. This is due to the major infestation at Powell. Mussels are appearing on boats that are there less than a week. 435-649-9540. Go to www.stdofthesea.com for more information. Click Here to Opt-In to Text Alerts. Check out the “Park Events” section of this website for a list of current events and activities including info on boat slips and dry storage. Jordanelle Reservoir is one of Utah's most famous waters, and is known as a trophy Smallmouth Bass fishery. It also has some real trophy sized a href='../utahfish/browntrout.php'>Brown Trout and some big Largemouth Bass as well. The perch fishing at Jordanelle is also very fast. The DWR recently increased the limit on perch at this reservoir from the statewide 20 fish to 50 fish for Jordanelle. Jordanelle also provides a great trout fishery as well. 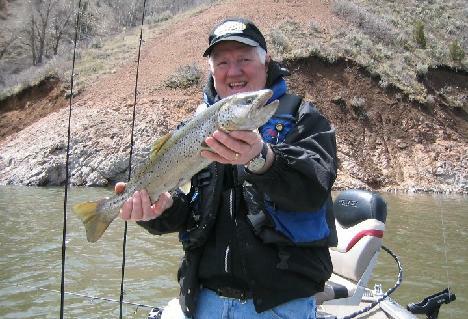 The lake is home to several species of trout, including the native Cutthroat Trout, the a href='../utahfish/rainbowtrout.php'>Rainbow Trout and Brown Trout. Jordanelle is located between Park City and Heber valleys, near Kamas, Utah in Wasatch County. It is a beautiful lake set around the beautiful Wasatch Mountains. 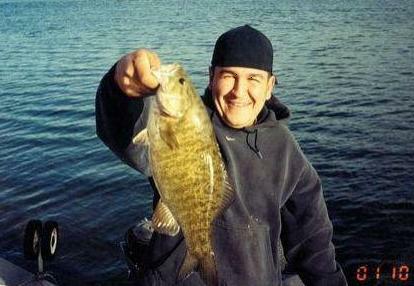 If you go, you'll enjoy a great lake for fishing as well as many other aquatic activities. There are 2 main areas, both Utah State Parks. One is the Hailstone Marina, on the north end of the reservoir. The other is the Rock Cliff Recreational Area, located on the East side where the Provo River enters the reservoir. Always double-check the latest fishing guide for current regulations! Click here to view current conditions at Jordanelle Reservoir. You can view and even control a webcam provided	by www.utahlakeview.com to check on ramp conditions and weather before you go. For perch fishing, use small curly tail or crappie jigs, and the first perch you catch to tip your lures with a small strip of perch meat to 'sweeten' the presentation and increase your success.